Stage 1 – complimentary consultation. We’ll begin by carrying out a thorough examination to make sure you’re suitable for Invisalign. We’ll then talk you through the treatment process, show you examples of Invisalign aligners as well as written and video testimonials from real patients. This is a perfect opportunity to ask any questions. Stage 2 – transparent pricing and treatment plan. You’ll receive a detailed treatment plan with clear pricing that explains everything that’s covered. Your fully comprehensive price includes all necessary appointments and aligners as well as free retainers to keep your smile looking good well into the future. Stage 3 – taking impressions. If you decide to go ahead, we’ll take impressions and photographs of your teeth. These are used by Invisalign to design and produce your bespoke aligners. Stage 4 – free smile simulation. Before treatment begins we’ll show you a 3D animated movie of how your teeth will move with Invisalign treatment and how amazing your smile will look at the end of treatment. Stage 5 – fitting the aligners. When your first aligners arrive, we’ll show you how to take them on and off. Although the aligners are changed every 1 or 2 weeks, we see our patients every 8 to 10 weeks, to ensure that your progress is on track and to answer any questions. Stage 6 – retainers. Once your teeth have moved into their ideal position we want to keep them there. Impressions are taken and you’ll need to wear your clear retainers every night. 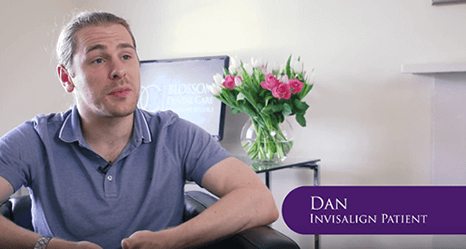 Why choose Blossom Dental Care & Implant Studio, York? We are York’s leading Invisalign provider and are proud to be the only team to have been awarded ‘Platinum Provider’ status. Our Invisalign experts have helped over 200 patients feel happier and more confident with their smiles through this transformational treatment. Your fully comprehensive treatment will be carried out by one expert from start to finish, supported by our dedicated treatment co-ordinator who will look after you throughout your exciting journey. Just as importantly, our transparent pricing gives you the peace of mind that everything is covered. We will see you regularly throughout your Invisalign treatment (every 8 to 10 weeks) to make sure that your teeth are moving according to the treatment plan. These appointments are also the ideal time to ask any questions. During treatment, you can also check your progress every time you change your aligner on the My Invisalign Smile App. If you are considering Invisalign braces with Blossom Dental Care, please take a look at our process to see how you can get started. Is Invisalign painful or uncomfortable? With no metal, sharp edges or individual brackets, Invisalign aligners are far more comfortable than traditional braces. You may notice a feeling of pressure when you first change each aligner. This shows that your aligners are working properly. Is it difficult to put Invisalign aligners (braces) in? Invisalign clear braces are very easy to put in and take out – when your first aligners arrive we’ll guide you through this. They are custom made to fit snugly over your teeth so you can be certain they will be perfect for you. How often will I wear the aligners? You should wear your aligners all the time, except when eating, brushing or flossing teeth. It is possible to take a small break for important events such as a wedding. Simply brush and rinse them in lukewarm water, then use the special cleaning tablets (we keep these in stock for your convenience). It’s important that you brush your teeth after each meal and before you put your aligners back in.